Indian skipper Mahendra Singh Dhoni started his Victory Chariot in Cricket World Cup 2011 and successfully registered a strong victory against Bangladesh in Mirpur. As has been predicted in MS Dhoni horoscope for 19 Feb 2011 – he was not only fortunate but successful too. The innings played by Virender Sehwag and Virat Kohli did provided strong support in Indian Cricket Team total. However, the efforts put by Bangladesh Cricket Team were also to be admired. Bangladesh Cricket Team managed to score 283 against one of the strongest Cricket Teams of the World. Had it not been Sehwag and Kohli great innings; there would have been problems to Dhoni in winning the Cricket Match against Bangladesh. Vedic astrology readings of Mahendra Singh Dhoni horoscope clearly indicated good support of luck. Dhoni’s expected performance during the Cricket World Cup 2011 during every cricket match is given here. Vedic astrology horoscope of Mahendra Singh Dhoni for the next Cricket Match against England is not very strong. Vedic astrology readings of Dhoni horoscope for 27 February 2011 are indicating downfall in the performance of Dhoni. 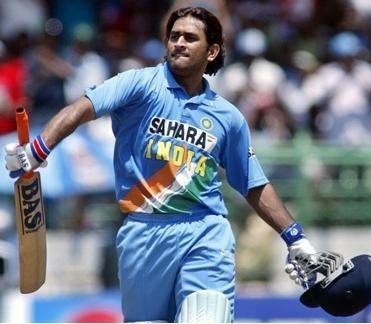 Complete vedic astrology horoscope readings of Mahendra Singh Dhoni for Cricket World Cup 2011 are given here. Mahendra Singh Dhoni needs to be very careful on 27 February 2011 and take decisions after thorough discussion with fellow team members. As such, Yuvraj Singh horoscope is comparatively stronger than Dhoni horoscope on the day – it will be much better if Dhoni prepares his strategy under consideration to views of Sehwag and Yuvraj. Although, the vedic astrology readings of Dhoni horoscope are indicating negative results- dealing with caution and care can surely reduce the negative impact of planets. To get personal vedic astrology predictions for your horoscope mail me at rajshekharsharma2010@yahoo.com or visit Birth Chart Astrology. The negative impact of planets in this cricket match against England appears to have started showing its impact. Virender Sehwag, the very trusted opening Batsman, is just reported to get some injury. Yuvraj Singh has also told to have some minor injury on his hand. hello sir, I am a great follower of ur blog. I read ur blog b4 start of every match. India somehow managed a draw at end. they were lucky. thy surely just escaped from a loss. I hope now they make it to quarter final. Sir, can you please provide us wat happens to india in quarter final and will they perform well there in WC?